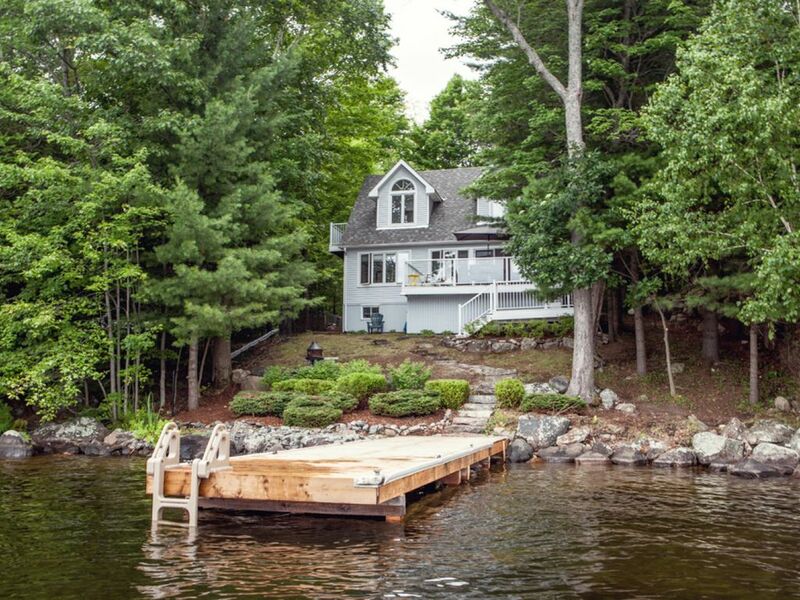 This comfortable waterfront cottage on Lake Muskoka is everything you can wish for in a relaxing family vacation! Equipped with brand new linens, extensive seating, BBQ, stand up paddle board and private dock, you can spend your mornings on the deck watching the quiet lake with a steaming mug of complimentary coffee or tea in hand and get ready for a sun-filled, fun-filled day in Muskoka. Sleep 8 easily in 2 queen beds, 1 pull out queen sofa in the living room, and the kids get to enjoy twin bunk beds! Upstairs master bedroom is a loft with its own bathroom and air conditioning. No AC on main floor but a great breeze off the water. Note there is a security camera outside monitoring the entrance. This 3 bedroom cottage is pure relaxation, with a lovely waterfront patio and comfortable outdoor seating. BBQ up a scrumptious lunch for the family or order pizza in, because we KNOW you won't want to always cook on holiday, right!? Upstairs is the master loft, which contains 1 queen bed and a private attached bathroom. The first floor has the other two bedrooms, den with pullout sofa and Apple TV with Netflix (no cable), and bathroom, dining room, living room and kitchen. Next door to one side the neighbouring home is quite close, however there is a lot of tree coverage so privacy is decent. Down by the water it opens up. To our other side is fairly private woods. The whole home will be yours, along with a private dock and a stand up paddleboard. There is plenty of parking for 3 or 4 vehicles depending on their size. Note we're on a septic system, which means ONLY toilet paper can be flushed. We'll reiterate this in the welcome book at the property and on a sign in the bathroom :) It's extremely important to follow this guideline or your security deposit will be used to pay for the emergency plumber.